Zach Gibson/Getty ImagesSen. 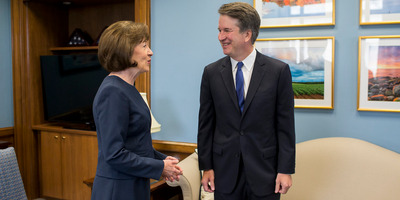 Susan Collins of Maine meeting with Judge Brett Kavanaugh in August. The US Senate on Friday voted 51-49 in favour of invoking cloture on the confirmation of the embattled Supreme Court nominee Brett Kavanaugh. Kavanaugh is now guaranteed a final vote after no more than 30 hours of floor debate, meaning the final floor vote on his confirmation could occur as soon as Saturday. Kavanaugh’s nomination has been tainted by two allegations of sexual misconduct from the early 1980s, culminating in emotional testimony from him and one of his accusers on September 27. The US Senate has voted 51-49 in favour of invoking cloture on the confirmation of the embattled Supreme Court nominee Brett Kavanaugh, meaning the final floor vote on his confirmation could occur as soon as Saturday night after no more than 30 hours of floor debate. Heading into the vote, all eyes were on crucial undecided votes of Sens. Susan Collins of Maine, Lisa Murkowski of Alaska, and Joe Manchin of West Virginia. 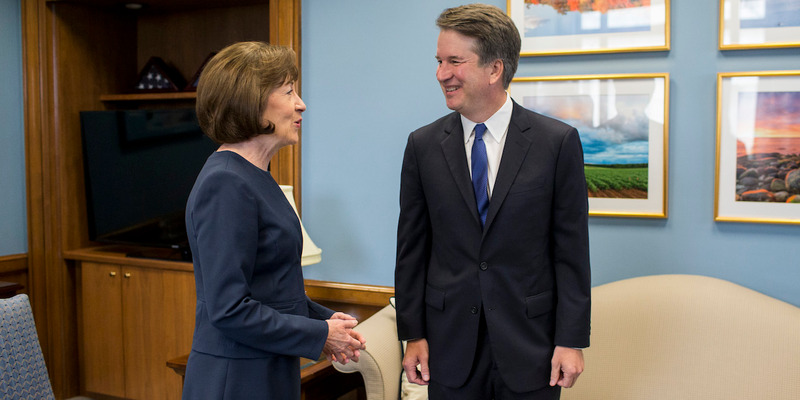 While Collins and Manchin voted to proceed on Kavanaugh’s confirmation, Murkowski, to the surprise of many, broke with her party and voted not to proceed on his confirmation. If all 100 Senators vote the same way on the final vote as they did for the cloture vote, Kavanaugh will be confirmed 51-49. While this vote to invoke cloture means Kavanaugh is guaranteed a floor vote on his confirmation, it’s still unclear how certain senators will vote; some who voted to advance his nomination could still vote against his confirmation. Kavanaugh’s nomination has been tainted by two allegations of sexual misconduct against him from the early 1980s, culminating in emotional testimony from him and one of his accusers, Christine Blasey Ford, on September 27. After Kavanaugh was heavily criticised for what some perceived to be an overtly partisan and angry defence of himself, in which he blamed the allegations against him on a Democratic conspiracy, the National Council of Churches, 2,4000 law professors, the editorial boards of the New York Times and Washington Post, and even former Supreme Court Justice John Paul Stevens have spoken out against his confirmation. One possible wrinkle in the final vote is that Sen. Steve Daines of Montana, a Republican, will be away from Capitol Hill on Saturday to walk his daughter down the aisle at her wedding. But Daines assured his colleagues he already had transportation arranged to be able to make it back to DC in time for a possible vote.